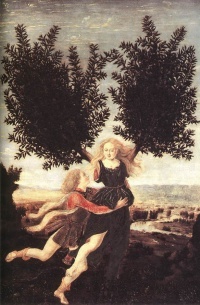 Apollo and Daphne by Antonio Pollaiuolo, one tale of transformation in Ovid's Metamorphoses—he lusts after her and she escapes him by turning into a bay laurel. Classical mythology or Greco-Roman mythology is the cultural reception of myths from the ancient Greeks and Romans. Along with philosophy and political thought, mythology represents one of the major survivals of classical antiquity throughout later Western culture. Classical mythology has provided subject matter for all forms of visual, musical, and literary art in the West, including poetry, drama, painting, sculpture, opera, and ballet, as well as forms of popular culture such as Hollywood movies, television series, comic books, and video games. Classical myths are also alluded to in scientific naming, particularly in astronomy, chemistry, and biology, and in the psychoanalytic theory of Freud and the archetypal psychology of Jung. During the Middle Ages and Renaissance, when Latin remained the dominant language in Europe for international educated discourse, mythological names almost always appeared in Latinized form. With the Greek revival of the 19th century, however, Greek names began to be used more often, and "Zeus" may be more familiar than "Jove" as the name of the supreme god of the classical pantheon. A classical myth as it appears in later Western culture is usually a syncretism of various versions from both Greek and Latin sources. Greek myths, originally transmitted orally, were narratives related to ancient Greek religion, often concerned with the actions of gods and other supernatural beings and of heroes who transcend human bounds. Major sources for Greek myths include the Homeric epics, that is, the Iliad and the Odyssey, and the tragedies of Aeschylus, Sophocles, and Euripides. Known versions are mostly preserved in sophisticated literary works shaped by the artistry of individuals and by the conventions of genre, or in vase painting and other forms of visual art. Roman myths are traditional stories pertaining to ancient Rome's legendary origins, religious institutions, and moral models, with a focus on human actors and only occasional intervention from deities but a pervasive sense of divinely ordered destiny. Roman myths have a dynamic relation to Roman historiography, as in the early books of Livy's Ab urbe condita. During the Hellenization of Roman literature and culture, the Romans identified their own gods with those of the Greeks, adapting the stories told about them (see interpretatio graeca) and importing other myths for which they had no counterpart. For instance, while the Greek god Ares and the Italic god Mars are both war deities, the role of each in his society and its religious practices differed often strikingly; but in literature and Roman art, the Romans reinterpreted stories about Ares under the name of Mars. The literary collection of Greco-Roman myths with the greatest influence on later Western culture was the Metamorphoses of the Augustan poet Ovid. Syncretized versions form the classical tradition of mythography, and by the time of the influential Renaissance mythographer Natalis Comes, few if any distinctions were made between Greek and Roman myths. The myths as they appear in popular culture of the 20th and 21st centuries often have only a tangential relation to the stories as told in ancient Greek and Latin literature. Greek mythology and Ancient Greek religion. Roman mythology and Ancient Roman religion. Unless indicated otherwise, the text in this article is either based on Wikipedia article "Classical mythology" or another language Wikipedia page thereof used under the terms of the GNU Free Documentation License; or on original research by Jahsonic and friends. See Art and Popular Culture's copyright notice. This page was last modified 10:13, 19 April 2013. This page has been accessed 4,778 times.